Hawksmoor’s Capstone Portfolio Management Service is a bespoke, discretionarily-managed service for clients with smaller portfolios (less than £100,000) where it is difficult to get a sufficiently diverse spread of sensibly sized holdings. Based on our three managed Multi Asset Funds, we create a ‘bespoke’ portfolio for your clients, according to their specific investment objectives and risk levels. As with all our Portfolio Management Services, portfolios managed under the Capstone Portfolio Management Service have the full benefit of our disciplined investment process. 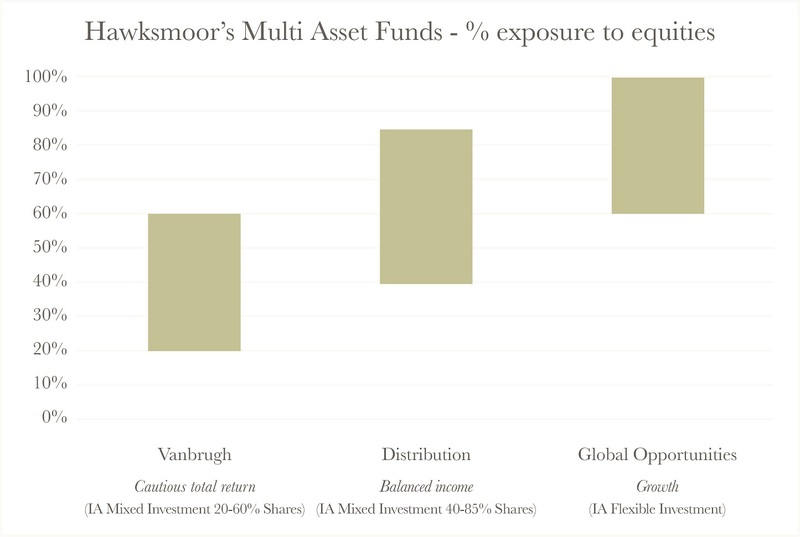 The chart below gives an idea of the relative ‘risk’ of each of the three Hawksmoor Funds. It shows the permitted range of exposure to equities for funds in their respective IA (Investment Association) fund sectors. You can find the current asset allocation, and equities exposure, in the Vanbrugh Fund, Distribution Fund and Global Opportunities Fund monthly Fund Factsheets (in the Useful Downloads sections). The Capstone Portfolio Management Service is suitable for trusts and charities, as well as individual private clients – and can be used within tax-efficient structures such as SIPPs, offshore insurance bonds and ISAs. There’s more information about our Capstone Portfolio Management Service in the Useful Downloads section, or you can get in touch with our friendly Business Development team using the contact details below. Our research teams regularly produce a variety of articles, blogs and in-depth reports on financial industry sectors.